Want to get pre-approved for that mortgage loan? We’re giving you the lowdown on the documents needed for mortgage pre-approval and why. If you are preparing to buy a home, one of the most time-consuming aspects of this can be the mortgage approval process. But being pre-approved for a mortgage can help make you a more competitive buyer in the eyes of a seller. This is because a pre-approval letter can be given to the seller’s representative as part of your offer on the property. It shows the seller that you have the means to make buying the property a reality and that they aren’t wasting time considering your offer. Read on for a deep dive into the documents needed for mortgage pre-approval! One of the most important documents you will need is your W-2’s from the previous two years. A W-2 is important because this is the form that reports your annual wages and taxes withheld from your paycheck over the course of the previous year. If you have worked multiple jobs over the past two years, you will need them all. If you are an independent contractor and not an employee, you may have 1099s or Schedule K-1 forms. These are the forms that reflect your income as an independent contractor. Another set of documents needed for mortgage pre-approval is your pay stubs. Your prospective lender wants to see who you are working for and where your income is being received. Your pay stubs are reviewed with your W-2’s. This helps your lender ensure that the information in both sets of documents is correct. By doing this, it helps protect both you and the lender. Your prospective lender wants to know this information because it shows job history. It also helps them to see your pay raises or decreases over time. Have you recently started working at a new company and received a pay raise? On the other hand, you might have spent years with the same company with a steady history of pay raises over time. These things can be important in demonstrating financial stability to your prospective lender. Other documents needed for mortgage pre-approval are federal tax returns and bank statements. Lenders will usually request these documents going back at least two years. For many filers, these come in the way of Form 1040’s. You may also have different documents like Schedule C, Schedule C-EZ, Schedule SE or others, depending on your filing status. For many borrowers, these are some of the easier files to gather among the documents needed for mortgage pre-approval. If you have received (or are receiving) a monetary gift from a friend or family member, this will also be important to your prospective lender. That’s because this is money that is above and beyond your earned income (what you are presenting in W-2’s, 1099’s, etc.). By providing a gift letter to your prospective lender, you and the gifting friend or family member is attesting that the money you received is not a loan. This helps give your prospective lender peace of mind that this money is not another loan obligation that you have. But let’s take a look at some other documents needed for mortgage pre-approval. If you are an investor or have investment accounts in your name, your prospective lender will want copies of each of these reports. Your brokerage account values help to provide a better picture of your financial status. This is because these are considered assets you have in places besides savings and checking accounts. When you apply for pre-approval, your lender should have an accurate look at your finances. One of the ways you do this is by providing proof of other income that you may have. Do you receive Social Security benefits, pension payments, child support or alimony payments? If you have any of these, you should gather documents that provide proof of this for presentation to your prospective lender. If you receive dividend income from stocks you own or checks from trust funds, these are also things to consider outside of your brokerage accounts. If you have a lot of different accounts, a helpful tip is to pull out a sheet of paper and write down all the accounts that you can think of that are in your name. This way you are being careful not to overlook accounts that your prospective lender needs to know about as part of the pre-approval process. Do you have outstanding debts? If so, these are documents needed for mortgage pre-approval. Take some time to consider what you owe money on. Common things may be a vehicle, boat, furniture, or electronics. Another important debt to report to your prospective lender can be any of your outstanding student loans. are interested in them because they to learn your debt-to-income ratio. Your lender is interested in them because they need to learn your debt-to-income ratio. Your debt-to-income ratio is a helpful mathematical formula. Add up all your debt payments. Write down that sum. Then add up all your income. Now right down that sum. Divide those two sums to get your debt-to-income ratio. Your lender will typically look at this number over the course of one year. By doing so, it helps them determine what amount you can afford to pay towards your mortgage each month. Some of the documents needed for mortgage pre-approval are a bit time-consuming. But gathering your social security card shouldn’t be! You will need to present a copy of your social security card as proof that you are who you are representing in your pre-approval application. This helps to prevent identity fraud. This crime occurs when someone gains access to your personal identity information. They then use it without your permission in an unauthorized manner. Oftentimes, this takes place in the form of taking out loans in your name or purchasing things online or over the phone. In 2016, there were 15.4 million victims of identity fraud in the United States, resulting in $16 billion in losses. You must also confirm your identity aside from presenting your Social Security Card. But there are some different ways you can do this. Among the documents needed for mortgage pre-approval is a driver’s license or passport. It’s best to bring these documents with you in person so that your prospective lender can make copies. A current copy of your credit report is needed in order for your prospective lender to get a complete picture of your credit history. Your prospective lender will run your information through a credit bureau to get your report as part of their review of your file, whether or not you provide your own copy. A credit report is a document that provides a detailed history of your credit accounts in the past and present. By gathering this information, these bureaus assign you a credit score. These typically range anywhere from 300 to 850, depending on which bureau you are using for your report. Credit bureaus gather this information in their databases to put together a full report on any debt obligations that you have had or do have. However, by obtaining a credit report on your own, you have a better idea of your credit score going into the process. It also helps you identify your debt obligations and ensure there aren’t any accounts taken out in your name that you did not authorize. “A significant shift in your credit score might be a heads up that there’s something wrong with your credit report,” said Paul Stephens, director of policy and advocacy for the Privacy Rights Clearinghouse, according to CNBC’s Kelli B. Grant. But remember, these credit scores will vary slightly from different credit bureaus. So don’t be surprised if your credit score changes by a few points one way or another from bureau to bureau. These credit reports are relatively inexpensive, ranging from around $15 to $20 per report. But if you want to avoid extra costs leading up to your application, let your prospective lender handle this. 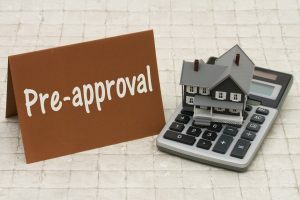 When you have a pre-approval letter as a prospective buyer, this helps show a seller that you are serious about an offer you place on a piece of property. It also can help speed up the process between the time your offer is accepted and your closing date. This is because the documents needed for mortgage pre-approval are some of the same ones that you will need later. This comes in handy when you are finalizing the loan before closing. Gathering documents like your social security card and driver’s license can be easy. For those, it’s often a matter of reaching into your pocket and pulling out your wallet where you keep them. But gathering other documents will take some more time. You may need to visit your bank’s nearest branch to gather older account information you can’t access online. You might also have to do some digging through your files to find things like older W-2’s, pay stubs, and tax returns. If you are getting ready to go through the mortgage process on a piece of property in Florida, contact the professionals at New Florida Mortgage! As a practicing attorney with a full schedule, the last thing I have time for is spending hours combing through mortgage documents and gathering paperwork. Using Marty allowed me to focus on my business while he handled everything. I have referred mortgage clients to Marty over the years and they have all had the same positive experience as I did.